The best way to avoid annoying pop-up advertisements is to stay away from suspicious websites and refrain from clicking unreliable links. Unfortunately, users still get infected with the likes of PowerfulBrowse ads, although we can hardly consider this adware application computer infection. The thing is that users install these programs onto their computers willingly, although they are not completely aware of that. The good thing is that it is not hard to remove PowerfulBrowse ads from the PC, and you should do it as soon as possible, because the longer adware application remains on your computer, the more potential security risks it might pose. This adware application always gets distributed bundled with third party installers and downloaders, because the direct download link at powerfulbrowse.com does not work. It is not surprising, because the same could be said about the rest of SuperWeb LLC adware applications, including BetterEnhance, FindoPolist, CrankWeb and others. It also means that you have an opportunity to avoid installing PowerfulBrowse ads onto your computer, if you read the installation wizard carefully, but the problem is that users tend to go through the installation process automatically, without even checking all the points and clauses. Thus, PowerfulBrowse ads enter the PC. Upon the installation PowerfulBrowse adds extensions to Internet Explorer and Mozilla Firefox web browsers. Although the generic information on the application at the official website claims that the extension is compatible with Internet Explorer, Mozilla Firefox and Google Chrome web browsers, Google Chrome seems to be immune. With the extension installed, you will be constantly bombarded with various commercial advertisements whenever you access popular online shopping websites, such as Amazon, eBay, BestBuy and so on. 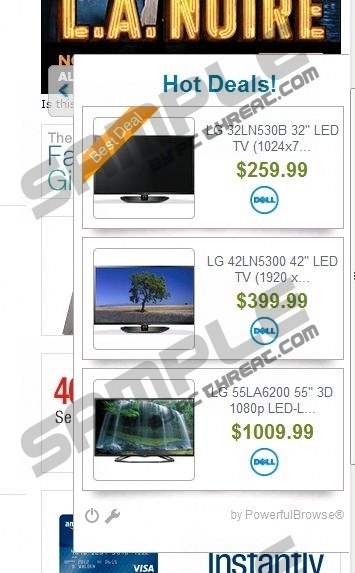 The pop-ups and other types of advertisements will be lablled as “ads by PowerfulBrowse” or “PowerfulBrowse Deals”. These advertisements are usually related to what you search for online, because PowerfulBrowse ads collect your web browsing information for marketing purposes. Sometimes PowerfulBrowse ads also add an additional toolbar on Google search page, and it redirects your search queries to Twitter, YouTube, eBay and Flickr. As long as you do not click the pop-up ads and redirected search results, you should avoid any potential threats, but the bottom line is that you cannot allow PowerfulBrowse ads to remain on your PC. Open Control Panel right now and remove PowerfulBrowse ads immediately. The extension will be deleted from your browser automatically. Afterwards, you should also scan the PC with SpyHunter free scanner in search for other potentially unwanted applications. Do not hesitate to invest in a licensed antispyware tool if need be. Also, you can always leave us a comment below if you have any further questions on PowerfulBrowse ads. Select Uninstall a program and remove PowerfulBrowse. Go to Uninstall a program and remove PowerfulBrowse. Select Add or remove programs and uninstall PowerfulBrowse. Quick & tested solution for PowerfulBrowse ads removal.